“Left alone, copywriters write ads to impress other copywriters, and art directors make layouts to impress other art directors. The purpose of my ads was to project the agency as knowing more about advertising. You may argue that this strategy was ill-advised, knowledge being no guarantee of “creativity.” But at least it was unique, because no other agency could have run such advertisements — they lacked the required knowledge. David Ogilvy took maximum advantage of his first job in the States as a pollster with Gallup to create mammoth ads that landed whale-sized clients. After reading one of these ads, you’re left feeling there couldn’t possibly be another agency on the planet that can hold a candle to Ogilvy and Mather. 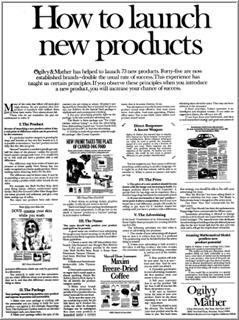 Sure, there were excellent house ads by other agencies — like Sackheim & Co. and Schwab and Beatty — created long before these, but they paled in comparison to the boldness of Ogilvy’s ads. 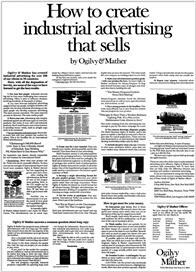 Ogilvy crammed so much information, statistics and test results into these ads that they were a tour de force in print. 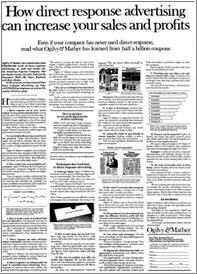 From a direct response marketer’s or freelancer’s point of view, the later ads by O&M aren’t of interest. 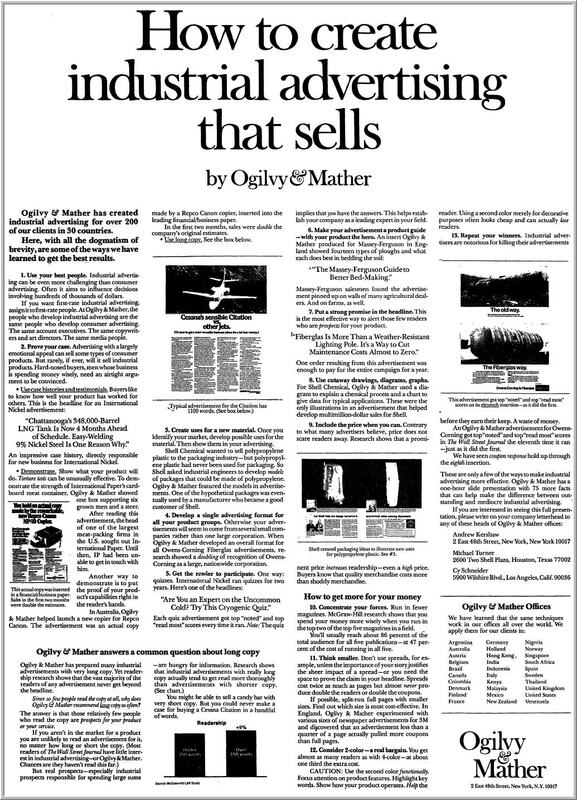 David Ogilvy had faded into the background and O&M drifted from the direct response bedrock that defined their success. They looked like any other Madison Avenue agency. 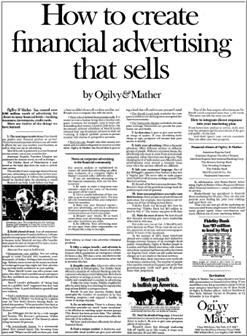 Interestingly, Foote, Cone and Belding successfully used this approach in a joint advertising venture with the “Wall Street Journal” several years after O&M stopped running these magnificent house ads. Gary Bencivenga also penned a memorable John L. Sullivan style challenge in the mold of Ogilvy and Mather’s house ads while copy chief of Dan Rosenthal’s ad agency. How Does a Freelancer Use These Ads Today? If you’ve got the appetite for swallowing a whale, the O&M house ads need to be in your swipe file. Model these ads and use the startling power of online databases as your research department. It doesn’t matter if you’re a one man shop. It’s the boldness of the approach that counts and the perception that you’re the ultimate advertising authority. With some judicious use of outsourcing that you’ve vetted before you go to print and you’re ready to land a whale. Don’t forget to aggressively pursue remnant or distressed ad space to make this an ultra-low cost undertaking. Here is a large verison of: How to Create Industrial Advertising That Sells. [WORDPRESS HASHCASH] The comment’s server IP (80.33.158.197) doesn’t match the comment’s URL host IP () and so is spam.